While Leavenworth, WA may have a thriving winery scene, craft beer and breweries are certainly on the rise! In fact, you’ll find some of the most awarded beers in the state of Washington right here in our Bavarian-style village. During your next stay with us at Pine River Ranch, here are some local Leavenworth, WA breweries to relax with your loved ones and taste delicious and unique craft beers. Don’t forget to request your free copy of our Vacation Guide to find even more local breweries and other fun activities that you won’t want to miss. Icicle Brewing Company in Leavenworth, WA distributes award-winning craft beers throughout Washington state and Northern Idaho. The brewmasters believe that making great beer means using only high-quality ingredients. That’s why each of their beers is crafted with fine malt, yeast, and hops from local companies. Plus, the water used to make the beer comes straight from Icicle Creek, located less than a half mile from the brewery itself! In the tasting room, a menu of tasty appetizers is also available for those who would like to enhance their beer-tasting experience with savory snacks such as warm Bavarian pretzels, cheese plates, or soups. Combining the brew master’s love of dogs and beer, Doghaus Brewery in Leavenworth, WA is a tiny local nano-brewery that has made a giant impression on the community! In the dog-friendly tasting room, you’ll be able to choose from eight brews crafted right in-house, each inspired after a dog breed! The mission statement of the brewery is to brew good beer, provide an entertaining and communal atmosphere, and have ALL the dogs. Whether you’re a pet lover or a beer lover…or both…this is the place to go! Blewett Brewing Company in Leavenworth, WA offers much more than just delicious craft beers. In fact, many visitors come here to indulge themselves in tasty and unique pizzas! After deciding on a fresh beer to sip on, check out their menu of tasty salads and pizza that are sure to perfectly complement your brew. 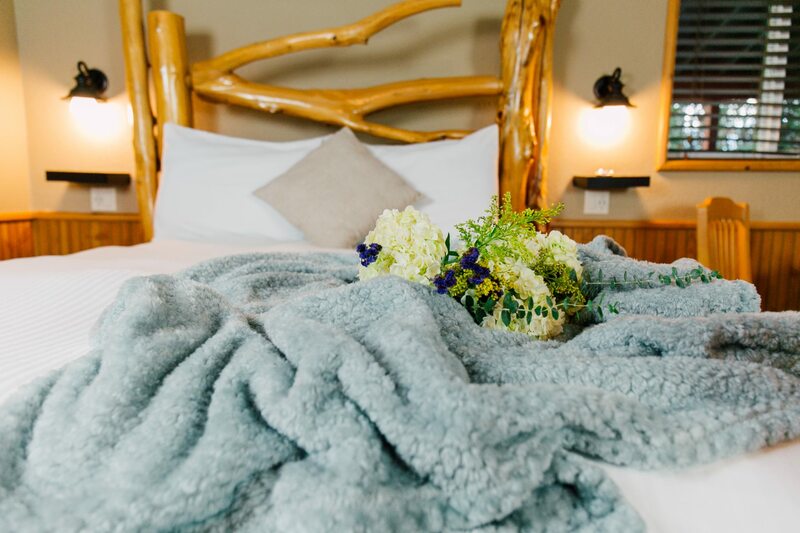 Located just minutes outside of Downtown Leavenworth, our rustic-style bed and breakfast and wedding venue is the perfect place to stay during your next getaway to Washington state. Surrounded by the natural beauty of the Cascades and boasting six unique guest suites, you’ll be sure to make memories that will last a lifetime. For our beer-loving guests, we’re proud to offer a special beer add-on to your stay! With this irresistible offer, you’ll enjoy a growler of beer from Big E Ales to sip on while you’re in your room. That way, after a long day of Leavenworth adventures, you can look forward to coming back and enjoying a glass of ice cold beer on your own private porch or in front of the fireplace. It’s everything you need and more for an unforgettable romantic escape. Book your favorite room with us at Pine River Ranch today and don’t forget to include the growler of beer with your reservation!